TFL says it needs more time and more consultations on Kings Cross. After a consultation in 2015 by TfL, the third in 20 years, TfL suggested dramatic changes in 2016. It involved changing streets adding cycle lanes, adding crossings. Here are some of the further particulars of the report. Last year, when I raised the matter, Islington Councilor Paul Convey, who keeps a close interest in this matter, believed that the process would begin this year, 2018. The only work that did however continue is further up South on Kings Cross Road, due to the construction of the Cycle Super Highway CS6. This seems a long wait, maybe endless, for people in the area, not just those who live here, but the millions of pedestrians that go through that area. The traffic and pollution and obstruction are constant. Maybe there are also other reasons. Repeatedly one reads on TFL’s financial losses. Maybe there is simply no money in the chess drawer for new plans? Example near Weston Rise. Still economy of car traffic over experience and safety of pedestrians? When I recently asked, as I do from time to time, if a pedestrian crossing over Pentonville Road could be slightly improved by moving it a bit (at Weston Rise) to make this crossing at this very busy road an easier and safer pedestrian experience, I was right to be sceptical and wonder, if I should bother highlighting the issue at all. The issue is but one small silly oversights of many. I had found through day-to-day observation over three years now (it is on my daughter’s way to school, which I frequent five days a week) that 90 per cent of Southbound pedestrians, amongst them many school children, did not use the push bottom operated crossing here at all, in spite of it being there. In other words, the local public condemned the crossing as totally not fit for its needs. If you are interested in the partculars see the end of the article in (1). In any case, after highlighting the issue, I did receive a phone call from TFL An officer told me told that “traffic flow” was the all-important factor (so not pedestrian safety or experience), and even though my points were heard, nothing would change. Over ten years ago, I informed TFL that at the beginning of Swinton Street (Eastern End) and Kings Cross Road, there was no traffic light crossing, making this spot on the fast running busy road very dangerous. After an accident, TFL finally decided to agree with me and be sensible and construct a traffic light there. It is however only a push button operated traffic light, but still (see later for more on this point). TFL improved this zebra crossing design on both ends, including the lights, because traffic frequently ignored it. The crossing over at Pentonville Road and Rodney Street and Penton Rise was also a recent change, with some improvements (better, though not completely foolproof for cyclists). It required, however, more than my letters, but the needless death of Madeleine Rosie Wright, a female cyclist, who crashed with a lorry for that improvement to occur. Kings Cross Road – York Way junction was also redesigned, following the ferocious and spectacular crushing death of the St. Martins Art student Deep Lee. So evidently TFL is not completely deaf to requests from well-informed locals, who know the streets best, though TFL seems to be more willing to listen and more in a hurry once the violent death of somebody confirms system flaunts. Sometimes the changes are however lacklustre, and they were so particularly under Boris Johnson’s mayoral regime. For example, the crossings at Swinton Street and Kings Cross Road (to Travelodge Hotel) are push-button only operated, even though traffic is always stopping at the junction between Penton Rise, Kings Cross Road. Pedestrian traffic lights at Swinton Street could be easy with these without holding up too many cars unnecessarily. One other simple change we are yet to see, and that was announced to be tested, is a 20 Miles Speed limit trial. So far this has only be implemented on the most Southern part of Kings Cross, leaving fast running one-way streets of Pentonville Road, Kings Cross Road and Swinton Street as racing tracks and potential death traps when the roads are emptier. The many consultations are a testimony to TFL knowing that it has to act. Bit sometimes consultations can also be used to delay things, already known. One would hope for a rather sooner than later progression from the consultation stage to actual construction. This is particularly so, as I remember the very first consultation on Kings Cross traffic and the gyratory that I witnessed being around early 2000. 18 years have passed since, and the wait appears to be longer still, in spite of assurances. That is nearly two decades ago. Having to wait that long, is already too long. but it also requires pedestrians to wait for over two phases (one for each side of the road), because each side is separately activated. So to get there you would have to walk some 40 meters Westwards. Then push the button. Then one must wait some 2 minutes or longer, then one walks across to the middle. Here one presses the next light. Another long wait. Then after crossing that stretch walk about 70 meter hill upwards to the bus stop, which can take sometimes five minutes extra. Trying to rush over Pentonville Road not using this crossing can take 20 seconds or your life. Not considering the later, the great majority of pedestrians crossing this dangerous road without using the traffic lights. Therefore the light is a). in the false place (pedestrians coming up from Kings Cross Road via Weston Street to attend to bus-stop Eastwards going Penton Rise Station ), b) and also takes ages to cross if used, due to a 2x need of pressing for each side of the street separately. A crossing 250 meter up at Rodney Street – Pentonville Road – Penton Rise allows crossing in one go, and the traffic light is phased in a faster cycle after being triggered. The reason? It is cars that are waiting in Rodney Street, not pedestrians. Cars there trigger a movement sensitive traffic light and the wait is relatively short. Pedestrians likewise do not have to wait as long as at Weston Rise. It would be easy to connect those two traffic lights. Pentonville Road, Perspective from the Penton Rise bus stop. See Trafic lights in teh distance, and Weston Rise on the left. Classic car accidental! All I was asking to start with is moving the lights slightly Westly to go in line with Weston Rise, and if possible to get the phasing in line with Rodney Street – Pentonville Road. It required no big change, but a little bit shifting and logical linking up. This, in spite of clear intentions, at least in words, to wish to improve pedestrian experience in the area (or say safety). On the other hand, waiting times and the two-phase system is similar to the junction between Kings Cross Road and Pentonville Road, further down. Here again, there are frequent pedestrian runs over the street during the red phase, because the waiting time for pedestrians is so long. The pedestrian crossing at Caledonian Road with Pentonville Road may be the worst of all, and it is much worsened by the building works going on there. There is a huge need for a crossing on the Eastern flank of that junction. And there is more. 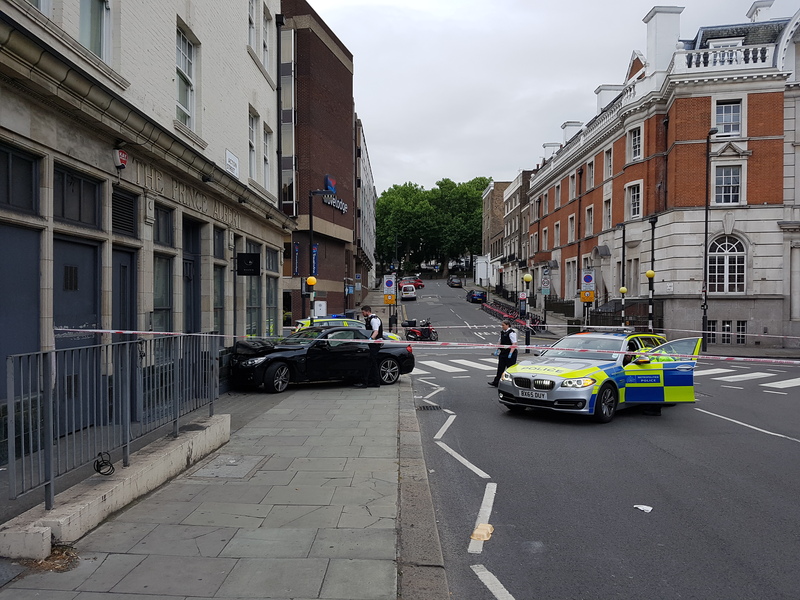 Pancras Road has become a new danger spot. In spite of being in front of the international station. On your search for an Indie Cafe that truly supports the local community and can serve as a local hub for events of all sorts at Kings Cross, you may mostly not be lucky. Kings Cross has increasingly become contested territory. Now a new cafe community-space is trying to fill the much-needed gap, trying to escape the “just for profit cause it is Kings Cross” tag. Located at 116 Pentonville Road and running under the name, “Time for…”, the space is changing its guise several times a week. Tuesday to Thursday it is running as a Cafe in the daytime, but at other times transforms into an Art Space, a Yoga, Pilates and Feldenkrais Exercise Venue, a Theatre, a Drawing Class, an Open Jam stage, or into a gallery. Time for… is owned by a charity and largely run and staffed by volunteers that are part of the local community, though there are charges for professional classes. 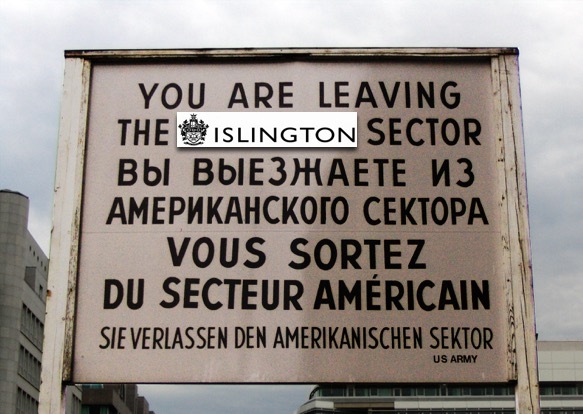 In a new jobs boost for Kings Cross the Foreign Secretary Boris Johnson, lately of this parish announced that Kings Cross would become a vital border checkpoint for crossings between Camden and Islington post Brexit. This role, to be manned by a rotating staff of 100 heavily armed men and women will make up for the jobs lost at Eurostar when travelling to France becomes bureaucratically impossible in Summer 2019. 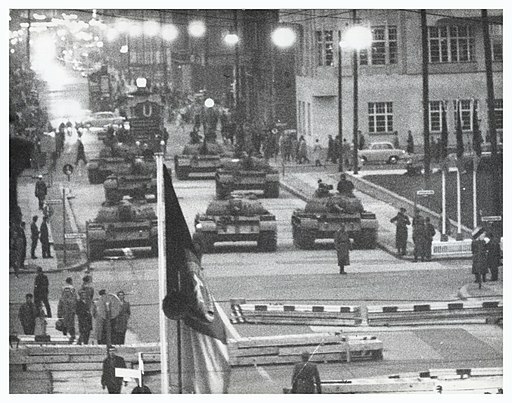 The Kings Cross gyratory will be de-risked by occupation with armoured vehicles, making moving traffic impossible. Thursday and the volunteers from London Wildlife Trust at Camley Street Natural Park were hard at work again. They were looking after the rich mix of naturally set and cultivated plants on the towpath and the path above between Maiden Lane (York Way) bridge and the Islington Tunnel. This important semi natural landscape is home to a wide variety of urban wildlife. To many, it doesn’t look as pretty as the fully cultivated planting the other side of the Maiden Lane (York Way) bridge, in the private estate of King’s Cross N1C. But to those of us who are fans of urban wildlife and the complex ecological setting it needs, the Islington stretch of the Regent’s Canal at King’s Cross is a vital lifeline and deserves the wonderful work regularly done by staff and volunteers at Camley Street. If you’d like to help look after this beautiful and rare green space in Islington, contact the London Wildlife Trust. PS, Daisy dog did all the work of course!!! The Royal Mail infrastructure of tunnels that connect East London Whitechapel with the Ventral London Mount Pleasant Postal Sorting Office and the West London Paddington Station and which was closed in 2003 will scandalously reopen in September 2017 as a Postal Museum tourist attraction called “Mail Ride” (see here). The network once built by the taxpayers purse, which was in operation for 76 years, between 1927 and 2003, was argued in 2003 to be too expensive to be continued to operate and repair. Royal Mail claimed it was five times more costly than transportation by trucks on roads. The Communications Union (CWU) countered at the time, however, that these costs were hyped up. Royal Mail proceeded to move much of the post that went through the tunnels onto road based trucks which increased traffic on roads throughout the city. A Greater London Authority (GLA) Study in 2013 noticed that this increase was equivalent to an extra 80 lorry journies per week on London roads, with a not insignificant environmental impact (dust particles and noise pollution) See The Future of Rail Mail, GLA, April 2013. At the time of the closure, Royal Mail faced losses of nearly 1/2 bn. Pounds (£484 Mio), which let, in the end, to the national service’s complete sale by the edict of thee Conservative government in 2015. In spite of intense discussions about the congestion on London’s roads and the pollution it caused, Royal Mail, now a private company, no longer felt it would be right to consider using the tunnel network and getting lorries off the road. Instead, in an almost cynical move, part of the tunnels are now going to be used for museum tours, costing £14.50 or £16.50 with a donation to normal paying adults, where visitors can have a ride on purpose-built trains along the old tracks. UK national media like the BBC and the Guardian have been invited for pre-opening tours, but their reports lacked any critique or awareness of the controversial history of the closure, focusing on but what the Postal Museum wanted to get out, namely “here is a history-themed “fun ride” ( See BBC Report and Guardian Report). The Kings Cross Community, which is part of the London population that had to tolerate the increase of 80 Royal Mail lorries per week alongside many other areas on already overloaded and congested roads, sees Royal Mail traffic through its roads as a problem. We have seen little signs of willingness or cooperation to change traffic from the Mount Pleasant Central sorting office to less polluting vehicles or electric vehicles for example or to offer any solutions to mitigate the environmental impact of their road-based transportation. They like to stay quiet and out of the discussions on this. Yet one partial solution was and continues to be right underneath the renovated postal office, an idea that worked, and was built by previous generations exactly at the time that London road congestion became an increasing problem. It is rather hypocritical to state that the tunnels are not able to carry mail any longer, but are good enough for human transportation, in fact, that a purpose built locomotive and compartments that can carry people were ordered for the purpose, and that Royal Mail believes that it can advertise these rides, which can be pre-booked now for its opening in September 2017, without controversy or argument. One poster doing so was seen at Kings Cross Underground station itself, an offence to all tube using local residents of Kings Cross when you consider that part of our mail could also take the tube, rather than the truck. It is a scandal that it took this community blog to highlight the controversy and hypocrisy of the scheme and expose it for what it is: A shallow money-making enterprise on the backing of a proud and futuristic scheme erected once by the public purse by gone by generations for the greater good. In fact, it is a scheme that was way ahead of its time, and in the climate of trying to reduce congestion and polluting traffic it ought to be considered to be more than just the latest London tourist attraction to yield money from rides, but its operation restarted and in fact, the track network extended. Post ed. Aug 2018. The revamped postal museum is doing well. What would visitors and tourists care for? Above true expose has received but little attention, and now the museum is a finalist for the art fund as well. This is how it goes in the corporate world, where nobody is prepared to look too closely anymore! It is only Londoners who carry the impact of the added 80 lorries per week. One wonders if we were ever consulted on what we thought, nor does it seems were our elected representatives in the GLA, who at first had highlighted the issue, able to keep track of what happened. A fabulous day out for all the family. Organised by Hillview Residents Association, with thanks to our volunteers & neighbourhood friends, our funders, Camden Council & The Frabcis Crick Institute. Hillview Estate, Whidbourne Street, King’s Cross, WC1H 8HH. In spite of not one, or two, but three expensive consultations since the 1990s on changing the gyratory system at Kings Cross, the roads remain race tracks, where cars and motorbikes regularly rev and speed up. Against the real evidence of speed related accidents on Swinton Street, Caledonian Road and now Acton Street, no significant changes have still been implemented. Residents were let to believe to expect traffic calming, counter traffic cycle lanes, ways to reduce speed, but the Kings Cross gyratory remains largely unchanged. 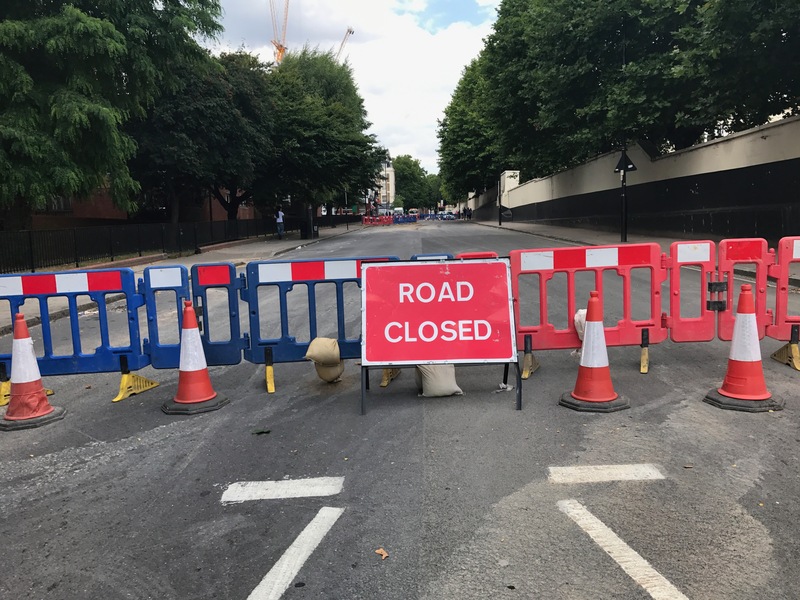 Even tiny Swinton Place is remaining a rat race track for whenever Swinton Street gets jammed up, and Britannia Street is used by motorists to try and short cut into Pentonville Road via Weston Rise, or consider the short cut between Penton Rise, Weston Rise and Wicklow Street. If it was not for me, there would not even be a pedestrian push button traffic light at the beginning of Swinton Street, something I persuaded TFL to install, after yet another high-speed accident at that corner, some ten years ago. Kings Cross, I know I have said it often, is a residential area today, with lots of pedestrians and cyclists. Children go to school here, adults to work, there are hospitals, student residences and hotels. We are not willing to continue to take the pollution by cars that are forced through our streets, nor do we wish to accept their noise nor the dangers posed by continuously speeding vehicles. “Mayor of London Sadiq will fight at every turn for better homes, better policing, better transport and an economy that works for business and for workers. Every Londoner should have the opportunities that so many of us take for granted but so many still do not receive. Sadiq knows that many local people feel that King’s Cross traffic gyratory system desperately needs redesigning, with concerns around safety for all road users and pollution in the densely populated area. Whilst parts of Kings Cross Road are now Zone 20, much of Kings Cross is still waiting for the traffic calming promised. This morning 3rd of July, 2017, an Audi crashed right into the zebra crossing island and into a house on Acton Street, as can be seen on the photo. That this remains possible is only caused by the broad speed inviting one-way street system that is continuing to give drivers a totally false idea. How many more accidents until changes are going to be seen, if I may ask, Mr Khan? A side note to Camden on other vulnerabilities at Kings Cross on their roads: Seaford Street / Harrison Street remains a short-cut into Grays Inn Road for motorists trying to avoid the traffic lights, and Harrison Street is bizarrely used for intermittent speeding by young motorists, as it has no speed humps, unlike Cromer Street. 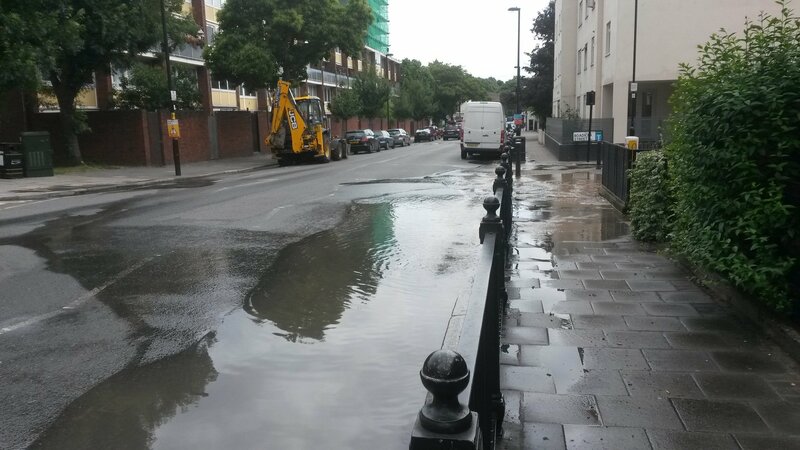 Heathcote Street / Mecklenburgh Square remains a short-cut for motorcycles between Grays Inn Road and Guilford Street in spite of it being a route used by nursery children to Thomas Coram’s Nursery and children on their way to Coram’s Fields.